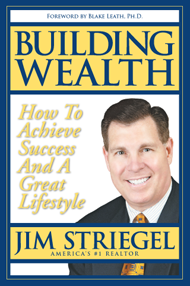 Jim Striegel shows you how sales and marketing can lead to a successful business in any industry. When it comes to building wealth and being prosperous, it means working hard to achieve success in all areas and focusing your effort on sharpening your tools and skills. It’s a continual process of learning and growing, and the highest producers in Real Estate are the agents who take things seriously and don’t follow the herd. In the end, building wealth and a great lifestyle is a personal decision – and it’s dependent upon you and your family’s individual needs and goals. Who cares how everyone else is doing it? Throw out the rule book, use modeling and the communication and wealth building tools in this book, and start creating momentum in your life each and every day. Forget about baby steps – take giant out-of-the-box steps and don’t look back to see what everyone else is doing. Make a commitment to think differently, and take action towards dominating your market today – or at the very least, carving out a comfortable niche that can fund your future dreams.